The original eight characters taunting on Battlefield in 8-Player Smash. 8-Player Smash (8人乱闘, 8-Person Fray) is a gameplay mode in Super Smash Bros. for Wii U and Super Smash Bros. Ultimate. This mode allows up to eight players to play together at once, as opposed to the standard four. In Ultimate, 8-Player Smash is not a separate mode with its own menu option; instead, Smash modes allow up to eight players to join. 8-Player Smash is a mode accessible within the Smash menu. 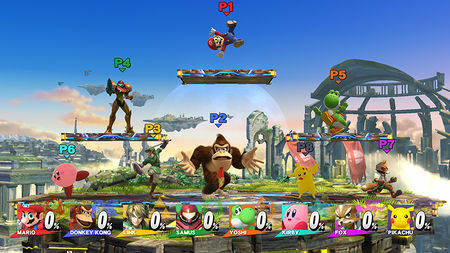 It is similar to the regular Smash mode, but it allows up to eight players to join, instead of only four as in other modes. The 8-Player Smash mode can still be played with four or fewer players, in which case it functions largely identically to the regular Smash mode. With more than four players, many stages function differently, and some stages cannot be selected depending on the number of players. Coin Battles and Special Smash cannot be used in conjunction with 8-Player Smash. In addition to red, blue, yellow, and green player colors for players 1-4, players 5-8 use the colors orange, cyan, purple, and slate, respectively. In Team Battles, an additional team color, the yellow team, can be selected. Only certain stages and their Ω forms can be selected; if there are more players present than a stage (or Ω form) allows, the stage's icon on the stage selection screen will be darkened and the stage will not be selectable. Additionally, several stages' hazards or other background elements will be disabled in 8-Player Smash. Custom stages are not available in 8-Player Smash. In 8-Player Smash, Ω form stages will be scaled up to approximately 1.6 times their normal size. Battles with more than four players in other modes, such as All-Star Mode and horde battles in the Special Orders mode, will count as 8-Player Smash and thus use the 8-Player Smash versions of stages. Bridge of Eldin 8 8 King Bulblin does not appear and the bridge does not blow up. Duck Hunt 8 8 The dog and ducks do not appear. Gaur Plain 8 8 Metal Face does not appear. Luigi's Mansion 8 8 The mansion cannot be attacked or destroyed, and the pillars are intangible. Lylat Cruise 8 8 The background is only set to starry space, though the space warp will still be shown. Mario Circuit (Brawl) 8 8 Shy Guys do not appear. Mario Galaxy 8 8 Background ships are removed. Midgar 8 8 No Summon Materia appear. Norfair 8 8 No lava-related hazards appear. Orbital Gate Assault 4 8 Arwings do not appear in the background. Palutena's Temple 8 8 The bridge cannot be broken. Pilotwings 4 8 The Planes do not appear in the background. Pokémon Stadium 2 8 8 The stage does not change its layout, and the screen that normally shows battle information is blank. Port Town Aero Dive 4 8 No F-Zero Racers appear. Pyrosphere 8 8 Ridley and other hazards do not appear. The lava doesn't flow in the background. Smashville 8 8 No background characters appear. The Great Cave Offensive 8 8 The stalactites and beams of light in the background do not appear. Town and City 8 8 No background characters appear. Umbra Clock Tower 8 8 The battle will not transition to Purgatorio. Wii Fit Studio 8 8 The background does not change to a mirror. Windy Hill Zone 8 8 Animal Friends do not appear. Woolly World 4 8 The terrain does not depress when players stand on it. The following stages are unavailable in 8-Player Smash in normal or Ω form. Custom Stages are also not available, with the option on the stage select screen replaced with the button for DLC stages (originally, the button for switching to Ω Forms). 8-Player Smash is not a separate mode in Ultimate, and instead, all Smash modes allow up to eight players to join. Stages are not restricted by number of players, and only a few stages have differences by number of players. Players 5-8 use the colors orange, cyan, pink, and purple, respectively; the latter two are changed from purple and slate, respectively, in for Wii U. In Team Battles, the yellow team can be selected regardless of the number of players. Pokémon Trainer functions differently in battles with more than four players. In such battles, the Pokémon Trainer will not be visible, but their voice can still be heard. The Poké Ball and its energy effects can be seen travelling towards the foreground, implying that the Pokémon Trainer is in the foreground, outside of the camera's view. Ditto can't be summoned if there are 5 or more fighters. Joker's taunts won't summon a cat with 5 or more players. All stages are available to play with any number of players. However, if a custom stage reaches half weight or above, it will be limited to four-player battles. In battles with more than four fighters (including Spirit battles with enough participants), Final Destination and all Ω form stages are scaled up to approximately 1.5 times their normal size. Additionally, a few stages have aesthetic differences in battles with more than four fighters (stage hazards and other elements that affect gameplay are retained with any number of players). Fountain of Dreams: There are no reflections in the water. Tomodachi Life: Only 2 rooms have Miis in them, as opposed to all 6. Wii Fit Studio: The background does not change to a mirror. Bowser Jr. and the Koopalings on Mario Galaxy. All of the Fire Emblem veterans on Coliseum. According to Masahiro Sakurai, 8-Player Smash was going to appear in Super Smash Bros. Melee, but was "more than impossible" at the time. Notably, usage of Melee's debug menu can allow for partially implemented 6-player battles, though this is only used for Multi-Man mode. Super Smash Bros. for Nintendo 3DS includes various unused elements for 8-Player Smash within its data. In competitive play, 8-Player Smash has been debated over, but is not currently widely played. When playing a Team Battle in 8-Player Smash, CPUs will almost always utilize the life stealing technique, even more often than they do in the other modes. Wuhu Island being shown with 6 players in one of Jigglypuff's screenshots on the official website. Skyloft being shown with 8 players in the official trailer for the third wave of downloadable content Mii Fighter costumes (at 1:20). Coliseum being shown with 5 players in Corrin's reveal trailer (at 1:37). Boxing Ring being shown with 8 players in the official trailer for the sixth wave of DLC Mii Fighter costumes (at 1:06). Wrecking Crew being shown with 6 players in the Final Video Presentation (at 32:57). Final Destination being shown with 5 players in a challenge grid image. The normal versions of Flat Zone X, Pac-Land, and Skyworld are the only stages without a maximum limit of 4 or 8 players (6). While Ω forms of stages are available in 8-Player Smash, Final Destination itself cannot be selected in 8-Player Smash. This is likely due to the visual-intensiveness of the stage's background animations. After the 1.0.8 update, players no longer have to select a separate page for Ω forms and can now simply press a button on the controller for the Ω version, like in a normal Smash. This means that the blue stage select color scheme previously used for the Ω form page is now unused. Every familiar stage in Smash Wii U has at least its Ω form available in 8-Player Smash. Only four of them (Delfino Plaza, Halberd, Port Town Aero Dive and Pirate Ship) have their normal form unavailable in 8-Player Smash. Pirate Ship and Miiverse are the only DLC stages in Smash Wii U that are not completely available in 8-Player Smash, with Pirate Ship being unavailable in its normal form and Miiverse being unavailable in either form. Through game modifications, it is possible to allow any stage or Ω form to be selected in 8-Player Smash. The stages are all functional, but some stages (such as Miiverse) will cause the game to lag due to the intensity. The majority of fighters have separate models for 8-Player Smash battles, to improve game performance. These models lack fluid hand animation, instead using sharp transitions between different hand states. Due to the fact that everything on Ω forms is scaled up in 8-Player Smash, stages with fog in the background have the fog visibly covering more of the geometry. This is most noticeable on the Ω form of Kalos Pokémon League. This page was last edited on April 22, 2019, at 14:25.